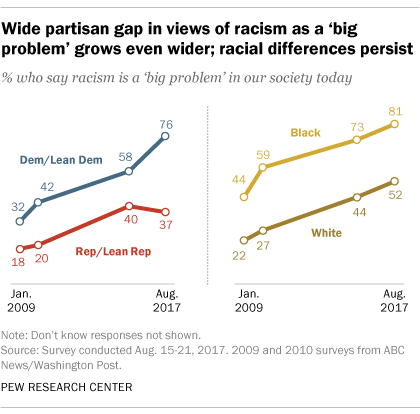 Since 2015, the increase in perceptions of racism as a big problem has been almost entirely among Democrats, making an already wide partisan gap in these attitudes even larger. 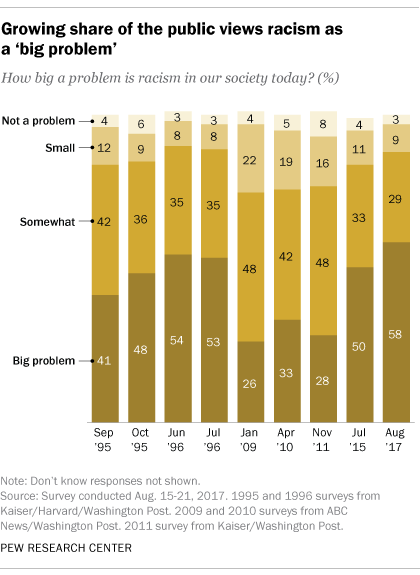 Overall, 58% of Americans say racism is a “big problem in our society,” while 29% say it is “somewhat of a problem.” Just 12% say racism in the U.S. is a small problem or not a problem, according to a new Pew Research Center survey, conducted Aug. 15-21 among 1,893 adults. Two years ago, 50% of the public viewed racism as a major problem for society, and in 2011 just 28% did so. Since 2009, the first year of Barack Obama’s presidency, growing numbers of both Democrats and Republicans have seen racism as a big problem. In 2015, 58% of Democrats and Democratic-leaning independents and 40% of Republicans and Republican leaners said racism was a major problem, up from 32% and 18%, respectively, in 2009. Since then, however, the share of Democrats expressing this view has climbed 18 percentage points – from 58% to 76% – while the share of Republicans saying this held relatively stable. Today, 37% of Republicans view racism as a big problem; 40% did so in 2015. The share of those who consider racism a big problem has grown among all racial groups since 2009, but blacks continue to be much more likely than whites to perceive racism as a major problem. About eight-ten blacks (81%) say racism is a big problem in society, compared with about half of whites (52%). Among both blacks and whites, there have been substantial increases in views of racism as a big problem over the past eight years. A 55% majority of Americans say they either strongly support or somewhat support the Black Lives Matter movement, while 34% oppose the movement. Overall opinions about the Black Lives Matter movement are more deeply divided along partisan lines than racial lines. Eight-in-ten Democrats and Democratic leaners (80%) support Black Lives Matter, compared with just 23% of Republicans and Republican leaners. Blacks are 30 percentage points more likely than whites (82% vs. 52%) to support Black Lives Matter. However, there is substantial gap between races in strength of support: 60% of blacks strongly support the movement, compared with 23% of whites. Note: Topline and methodology can be found here. Samantha Neal is a former research assistant focusing on U.S. politics and policy at Pew Research Center.